Our Director, Martha Segura, has been involved with Suite Adelines International for 36 years. She started in High School when her music director got her involved and singing in a local chorus. 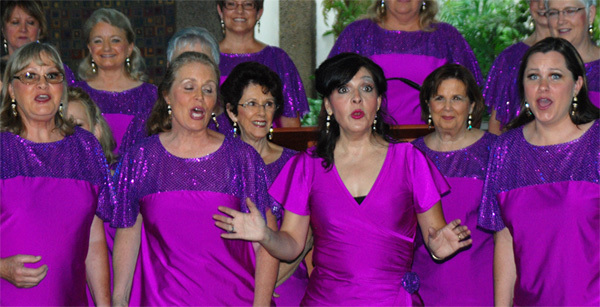 She started her Sweet Adeline career as a member of the Blossom Hill Chorus in San Jose, from 1980 to 1986. She then joined Mission Valley Chorus and eventually became their Director for 3 years, from 2002 to 2004. She led them to a Wildcard berth which was her first experience on the International Stage as a Director. Martha has also competed in quartets on the International stage since the 90’s. Her quartet, Razzcals, was a perennial Top Ten competitor for 10 years running. Their highest placement was second place. Martha now directs Southern Oregon Sound Chorus in Medford, Oregon. She has been with them since 2005. Martha’s passion for A Capella music and her enthusiasm, techniques and skills have led to major growth in the abilities and sound of the chorus. The chorus has become much more competitive, medaling in the regional competitions, culminating with a first place medal in 2011 in the Small Chorus Division and fourth place overall. Martha’s energy and enthusiasm as well as her skills put her in high demand with other choruses and quartets looking to improve their skills and sound. She started Underage Quartet, who was the Young Women In Harmony Winners in 2003. This quartet is now known as Love Notes. Her daughter Mary was the Base in Underage in its early years and is now competing with her new quartet, Swingline, on the international stage. Martha continues to work on a regular basis with quartets and choruses. In addition to Southern Oregon Sound, Martha works with Northern Gateway Chorus in Redding, California. As she worked with the two choruses, she grew a vision: to combine the two choruses together to compete in the regional contests every year as a mid-size chorus. Our first year doing this was in October, 2012, which yielded a first place medal in the Mid-size Chorus Division and third place overall during the Region 12 Competition in Reno, Nevada. This resulted in the opportunity for all of us to go to Hawaii in November 2013 to compete on the International Stage in the Harmony Classic, placing 5th in the competition. We have medaled every year since then; this year we finished in second place and fourth overall as a mid-size chorus at the Region 12 Competition in Reno. Martha is married and has four children. She worked for 25 years as a mortgage broker in the Bay Area of California. She and her husband, Jay moved to Rogue River, Oregon in 2004. She got bored so she now does inside sales for Farwest Steel in Medford, Oregon in addition to directing Southern Oregon Sound and Northern Gateway Chorus.